WEDDING PLANNING: JOY OR TORTURE? This is the situation: You're full of joy planning your wedding, the most special day of your life. You've been dreaming for ages about how your big day would be, but after some months you find yourself with a panic attack, trying to catch up with all the things left to do: contact lots of different vendors, attending some wedding fairs, organising the seating plan, finding the perfect wedding dress, the invitations... I know, it's a lot. But don't worry, today I'm here to help you. On this post you will find 10 amazing tips to avoid a meltdown! And remember, you must enjoy every minute of your wedding, even the organisation so don't hesitate to ask for help to family and friends (and your fiancé 😅) and delegate a little bit. Known before as World of Wedin, WeddingPlanner is my favourite wedding vendors listing website by far. You can find bridal boutiques, caterers and wedding cakes, florists, hair and make-up artists, marquees, wedding photographers, videographers, DJ's and bands, venues, wedding planners and much more. Additionally, since they changed their name they are offering planning tools to those brides-to-be and grooms-to-be who are planning their wedding. So you can have on the same platform an address book, a checklist, a wedding budget tool, a guests list, menus and a sitting plan. And the best news: they are running a competition until the end of November! They're offering four lucky couples the chance to win £250 each week in November. You just have to enquiry via their website with a code you will find there. So, what are you waiting for? If you are interested in commissioning me for your wedding photography visit weddingplanner.co.uk and you could get £250 off of any of my packages/experiences. Really? Yes! Your wedding photographer could be very handy with your wedding planning. In my case as a wedding photographer I need to know deeply how your big day is gonna be. And the most important thing: the TIMELINE. I work with my brides designing the timeline until it's perfect. And you wonder why? Well, because the more you work on the timeline the better your wedding is gonna be. Obviously, always something that your haven't planned happens, or you're behind the schedule but as I said the more you work on your timeline, the less mistakes and errors appear. As you have read already, this is one of the most important things to do before your big day comes. So why not starting right now with this handy spreadsheet?. I have added the most important parts of a wedding day so no excuse to not filling it out now! Few years ago I didn't know anything about spreadsheets, I mean I hated them. I thought they were boring and difficult to understand. But happens that my partner works in finances, so he taught me the importance of a proper spreadsheet. It allows you to be organised, keep track of every number and costs and it can be very very handy. We're talking about a very considerable amount of money when we talk about a wedding. Lots of spendings, payments, different vendors, different bank accounts etc... It can be a nightmare. So being organised and setting up a maximum figure is a must. If you don't do that trust me, you're gonna expend more money that you might have. And that's not cool, even for the most special day of your life. 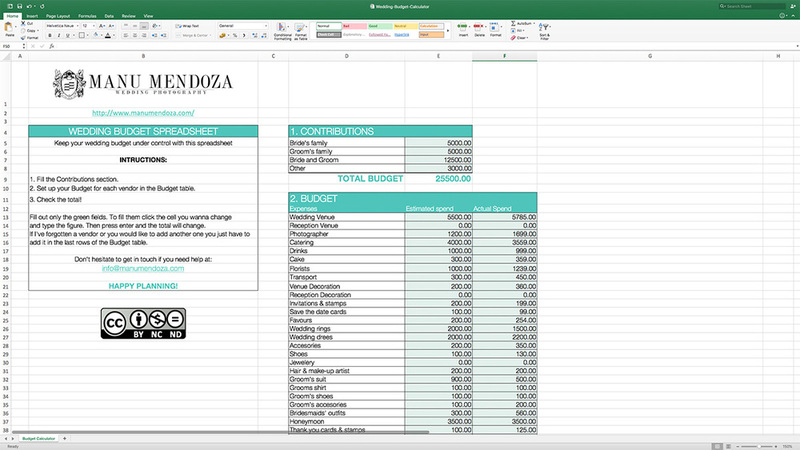 So, take advantage of me and download the wedding budget spreadsheet, a little gift from me 😉. You'll thank me later! Did you know that you're gonna have at least from ten to twenty different wedding vendors on your wedding day? That's a lot to keep on your mind. Imagine: You're at the hotel where the action takes place with your bridesmaids, waiting for your make-up artist. He or she is late and the meltdown starts. The nerves begin to eat you up and you don't know exactly what to do. Well, you think, I'm gonna call her up to see what's going on. You grab your phone and you realise you don't have her telephone number on your contacts. Ok, don't panic, I've got her phone on an email she sent me a couple of weeks ago, great!. But the odds wanna play with you and with your beautiful countryside venue in the middle of nowhere: no signal at all, what?!! Yeah, Hampshire is bloody beautiful but mobile network signal in the countryside is a nightmare. But suddenly one of your bridesmaids says, hey love don't worry I think the hotel has wi-fi. You breath and open the settings on your phone to search for the wi-fi while a drop of sweet comes down from your forehead. And surprise, there's no wi-fi because the signal is that poor that you can only join the network from the main lobby, seriously?? Yeah, a handy list stored on your phone could be really handy in that situation, so don't leave it to the odds and be prepared! Another gift from me, download the supplier's list where you can fill out their phones, fees, addresses, and many things more! You'll thank me again after your wedding! Well, this is not really a prep tool but a inspirational one. If you are a pinterest geek as I am you should know that you can find awesome things there. DIY, inspiration for the seating plan, favours, decorations and even some thing you don't expect. By the way, you can follow me on Pinterest and see some of my inspirational boards. Looking for the perfect wedding dress? Take a look at my Pronovias Barcelona board! This is something that more and more brides tend to do, and it's great. Setting up a wedding website for your wedding day can be a lovely idea. Why? Well, you can add your timeline, the venue's dress and all the information that your guests will need to know so, at any moment if somebody needs to consult something about your wedding day they just have to look up your website and that's all. Nowadays you can find a lot of options to create your own website, some of them free and some of them paying a little. One of my favourites is Squarespace because it's so easy to create a beautiful wedding website with two or three clicks that is very difficult to beat it. You don't need to be an IT engineer to do it, I promise. Now they have plans for a single page website for 60$/year (roughly £40/year) including a custom domain or a proper website from 96$ (£64)/year. You can take a look at one of their templates specially designed for weddings here. I nearly write down everything in my Notes app. It's quick and easy. However, it's got a downside: you can end up with hundreds of different notes on your phone so finding the one you want to look at could be tricky. Nevertheless, is one of the most useful apps I've got on my iPhone. If you stay organised, deleting the ones you don't need anymore makes it easy for you to find what your looking for at the time you most need it. Additionally, thanks to the last software update (iOS 9) now you can create checklists, add rich links and even draw! Notes is ok but Wunderlist is something else. This app is basically a task manager. It works like the app notes but with additional options and notifications that will be very handy to any person immersed in their wedding preparation. Wunderlist will let us add tasks to do with a due date, so when the deadline comes we'll get a notification in our phone, tablet or computer. 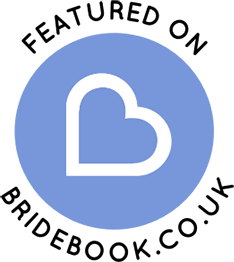 We also can add notes to any task, organise our task in different lists, share them through the app or by email, and the best thing about the app is that it's free. So, there's no reason to no try it now. I don't know if you do but I use the calendar on my Mac everyday. Being a wedding photographer I've got to be really organised and write everything down to don't go crazy. And I think the same principle can be applied if you are preparing your wedding. Sharing the same calendar with your partner will let you be up to date with any upcoming tasks or meetings. If you are a busy person or if you just want a professional to organise a beautiful wedding for you, a proper wedding planner would be your best option. You can search for a wedding planer on weddinplanner.co.uk or just google it. And that's it, the 10 TOP tools to prepare and organise your wedding. Hope you've found this post very helpful. And remember, feel free to comment below and share with me any tip you have for wedding planning! Additionally, feel free to share this post on Facebook, Twitter, Google + or whatever social network you're into. You can take a look at my website to learn more about me: Hampshire Wedding Photographer. 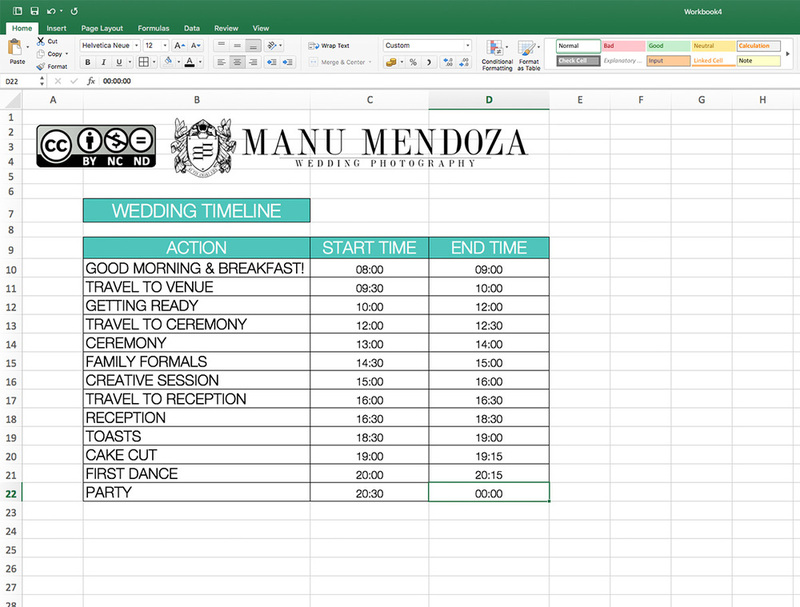 Wedding Budget, Timeline & Suppliers Excel Spreadsheets by Manu Mendoza Wedding Photography are licensed under a Creative Commons Attribution-NonCommercial-NoDerivatives 4.0 International License. Based on a work at http://www.manumendoza.com/wedding-blog/top-10-wedding-planning-tools.